Exciting as it is, moving is a pain. There’s the packing, the lifting, the unpacking -- and somewhere in there, you actually have to move your things from one home to another. You can always hire professionals to do this, but that can add a considerable cost to what is already an expensive process. And that’s how some movers suddenly find themselves behind the wheel of a truck that’s several feet longer and several thousand pounds heavier than anything they’ve ever driven in their lives. Driving a moving truck can be intimidating, but it’s not impossible. With an understanding of what’s different about driving such a large, heavy vehicle, any experienced driver can transport their own belongings without too much stress. And the savings from doing so can be significant. Research your rental company options, with particular attention to the features of their moving trucks. Modern trucks have tools like rear-facing video to help with backing up and blind spot sensors that make it safer to change lanes. 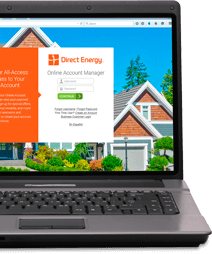 If these features are important to you, they may be worth paying a little extra for. Estimate how much truck space you’ll need for all your things. Most truck rental companies offer guidelines to help you figure out what size truck you need, and it’s important to rent the smallest truck possible. Smaller trucks are not only less expensive, they’re easier to drive. Consider recruiting a friend to join you on your moving journey. If it’s another experienced driver and your truck rental contract allows it, you can take turns driving. Having a second person can also come in handy if you need someone to direct you in backing up the truck. Buy a GPS mount. If you plan to use GPS on the trip, buy a quality phone or GPS mount that you can install in the truck. It’s dangerous to fumble with your device while driving any vehicle, let alone a fully-loaded moving truck. Get some practice. If this is your first time driving a moving truck, it might be worthwhile to rent a truck for a day just to practice. For in-town moves, truck rentals are often inexpensive. 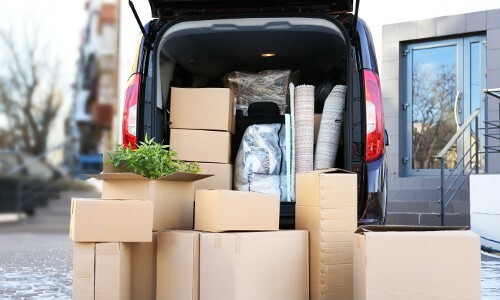 Practice can help you with things like turning and getting used to the size of the vehicle, but keep in mind that your truck will handle differently when it’s packed with all your things. Budget for gas. In general, moving trucks get poor gas mileage, and longer trips could end up costing you several hundred dollars in gas. Try the truck out first. Drive your moving truck around town for several miles before loading. This is a good way to make sure the truck is running smoothly and that there are no mechanical problems. If you discover an issue, take the truck back to the rental company and exchange it for another one. Secure your entire load with rope, bungee cords or straps. Truck rental companies often rent these accessories, as well. Pay attention to all road signs that apply to trucks, which you’ve probably learned to ignore. This includes separate speed limits, lane restrictions and overhead clearance limits. Stop safely. Always give yourself extra time and distance to stop the truck. Avoid shifting your load by driving slower than the surrounding traffic and using the brakes and accelerator gently. Check your side-view mirrors often, because there are no rear-view mirrors in moving trucks. Follow the law when it comes to stopping at weigh stations. These laws vary from state to state, but ABF U-Pack has compiled a comprehensive list of state weigh station laws for moving trucks. Use caution in mountains. If you’ll be driving a moving truck through mountains, keep in mind that there will be stretches of road with no shoulder for emergency stops. You’ll also need to prepare for steep hills and winding turns. Drive as slowly as necessary to ensure your safety. Avoid backing up. Try to avoid situations where you’ll need to back up your truck. When parking in a lot, for instance, look for two adjacent empty spots so that you can drive straight through. Buy the rental insurance from the truck company. Without it, even slight damage to the truck can be costly. If you’re truly nervous about the idea of driving a 16-foot moving truck, consider the other cost-saving alternatives to full-service movers. There are several moving companies that will do the driving as long as you do the loading and unloading. ABF U-Pack, PODS, 1-800-PACK-RAT and several other competitors offer a variety of shipping container types that you can fill over the course of a few days. In order to use these services, you’ll need a place to drop your containers at both your starting address and your destination, so they can be tricky for apartment dwellers in dense urban areas. If this is a problem, some of these companies will allow you to bring your items to a local shipping depot and load them onto a truck or into shipping containers there. With this option, you’ll probably still need to rent and drive a truck, and you’ll need to move everything twice on each end of the trip instead of just once. But you’ll spare yourself the worry of a driving a box truck over a long distance. 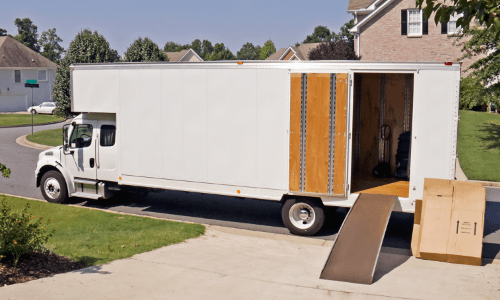 Driving a moving truck isn’t for everyone, but if you observe these best practices, you’ll walk away with a great sense of accomplishment and a little extra money in your pocket.